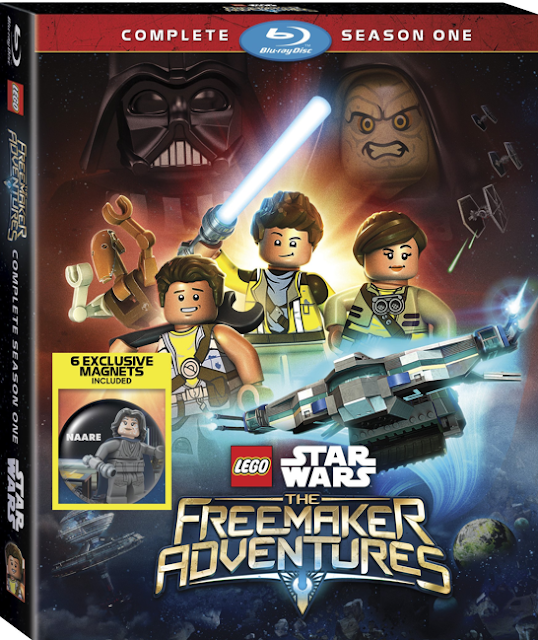 LEGO Star Wars: The Freemaker Adventures Complete Season One Arrives on Blu-ray and DVD on December 6th! Taking place between the events of The Empire Strikes Back and Return of the Jedi, these new adventures follow a family of scavengers who build and sell starships from battle debris strewn throughout the galaxy. When their youngest discovers a natural connection with the Force through an ancient artifact – the Kyber Saber –he and his family are thrown into an epic struggle against the Empire to restore peace and freedom to the galaxy. The Freemakers explore new worlds, meet new and familiar characters and discover the strength of family. Relive all 13 action-packed episodes in LEGO Star Wars: The Freemaker Adventures Season One. 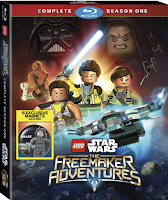 LEGO STAR WARS: The Freemaker Adventures Complete Season One! 6 Exclusive Magnets Packed Inside Each Blu-ray and DVD! 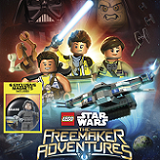 Join the Freemakers in their spectacular first season of LEGO Star Wars Adventures. Bonus Features: The Freemaker Adventures: Meet the Freemaker Family – Get to know the members of your favorite family of celestial scavengers – and meet the actors who bring them to life – in this fun collection of clips, behind-the-scenes footage and cast interviews! Freemaker Salvage and Repair - Visit the shop with the finest salvage in the galaxy as Rowan, Kordi and Zander take you on a tour of the family business. Voice Cast: Nicolas Cantu (upcoming TV movie “Hey Arnold: The Jungle Movie”) as Rowan; Vanessa Lengies (TV’s “Second Chance”) as Kordi; Eugene Byrd (TV’s “Bones) as Zander; Grey Griffin (Disney Channel’s “Miles from Tomorrowland”) as Naare andMatthew Wood (Disney XD’s “Star Wars Rebels”) as RO-GR.